Been reading the forum for a couple weeks and just got a new OBS model this week. Also ordered parts from Auber for installing a PID in the smoke generator. I've only plugged it in long enough to verify everything works like it should and I'm starting to install the PID now. Just thought I'd detail some of the things that are different from all I've found on the older ones. Biggest change is the temp control for the tower is in the SG. 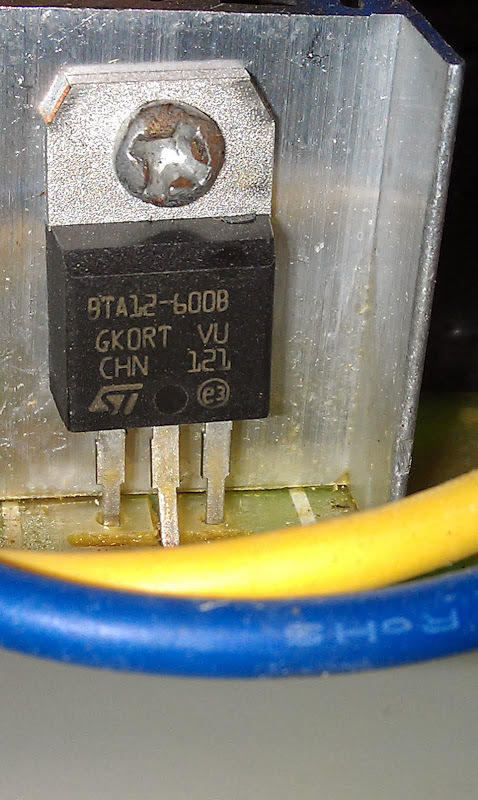 On the plus side, it seems the older slider type control was a big rheostat? Power went through the slider? It's been mentioned that for going to a dual element or the 900w finned element that the slider should be bypassed. On the 611, the control is just a pot. The power for the element is a TO-220 packaged device. Looking up the numbers on it, it's a triac capable of handling 12 amps. From what I've read, it will handle a dual / 900w element just fine, but I'm not sure how the dial pot works with the gate on the triac. I don't know enough yet if the pot will have to change for the higher current of the upgraded element. It might be that even on 'hi', the triac still won't pass full current. It'll be something to test out anyways. Not doing the element upgrade right off. Thought I'd try it out a few times first. The puck heater is always on when the main switch is on. The tower element comes on with the power dial. You can't really separate the two. 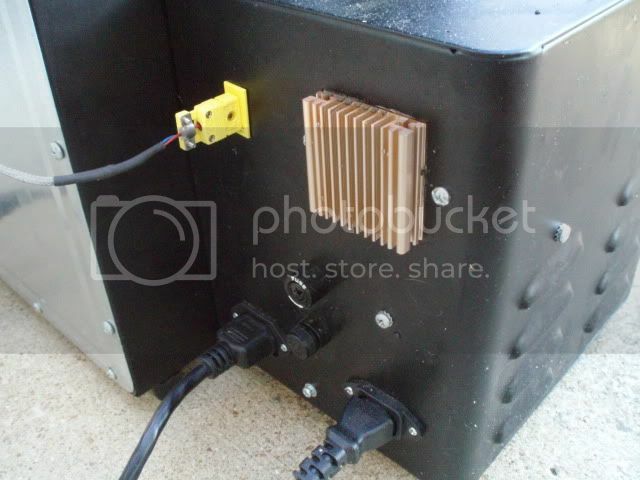 You could snip the wires leading to the puck heater element and insert a relay or switch. You could do the same for the puck advance wires too. But there's no separate board for the puck heater / advance. For my PID, I got the SYL-2352P. This has the ramp/soak feature, but also 2 alarm outputs. I haven't dived into the programming yet, but looking at the instructions before ordering, you can essentially turn either of the 2 alarms on/off for each step. I'm thinking I can use that to delay or turn off the puck advance if I want. I have gotten the thermocouple mounted in the tower at least. Working on the SG case next. I'll make up a short jumper to connect to the SG in use. Looks like it is coming along nicely. I have the SYL-2352 without the ramp/soak feature. 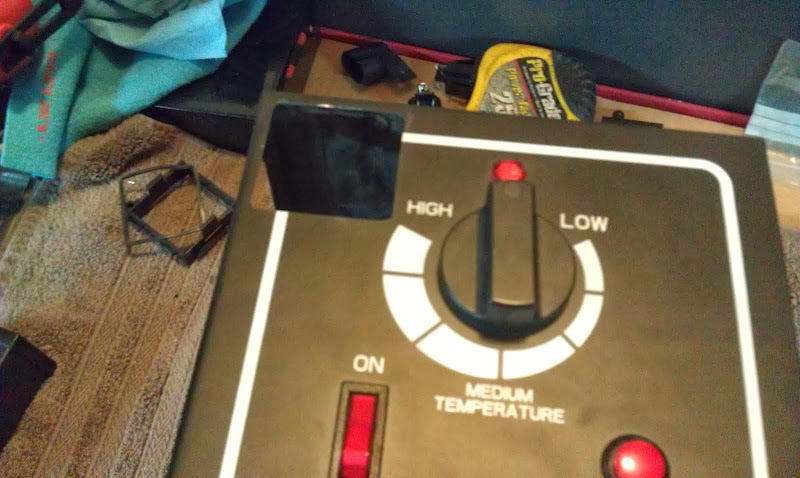 I have one of the output alarms programmed to turn on an air circulation fan when the chamber temp reaches 100*F, although I have not installed the fan yet. For turning off the puck burner mine is the older style OBS with its own on/off switch. 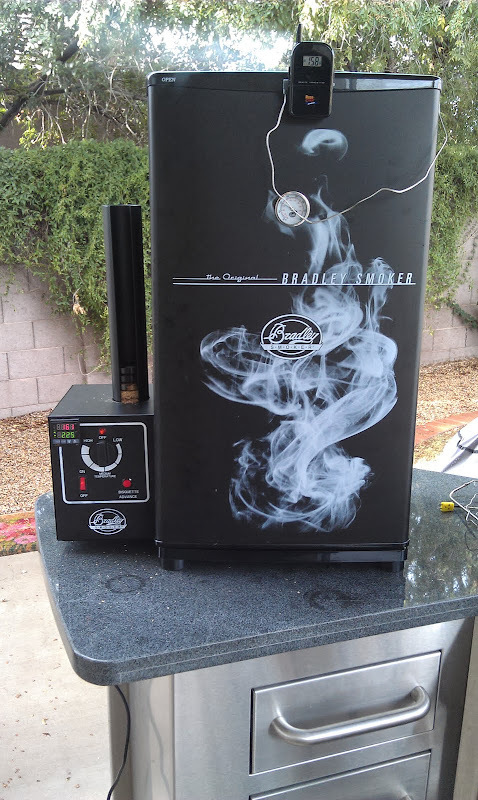 Whenever the smoking part of whatever I'm cooking is finished I just turn it off because I have to dump the spent pucks and change the water at that time anyway. As you mentioned, it would be easy enough to add a switch to the newer OBS to do this if someone wanted that ability. Other than personal preference, is there a reason to turn off the puck heater if you're using Bubba pucks? This one is designed to be on all the time & I figured it could only help out with the temps leaving it that way. Where did you find that heatsink? The one I got from Auber is just monstrous. There's no way I'm using it. Reading specs from a few different 25amp SSR's they all agree that heatsinks only start to be needed around 8 amps. For now, I'm just sinking it to the case until I find a more suitable heatsink. Also, how is yours mounted? Is the case sandwiched between the sink & the SSR? Or is the SSR mounted directly to the sink & there's a big hole in the case for it to fit through? Also, there's another difference with the 611. There is no external fuse holder. There is one, but it's in-line inside the case. You'd have to take it apart to change the fuse. 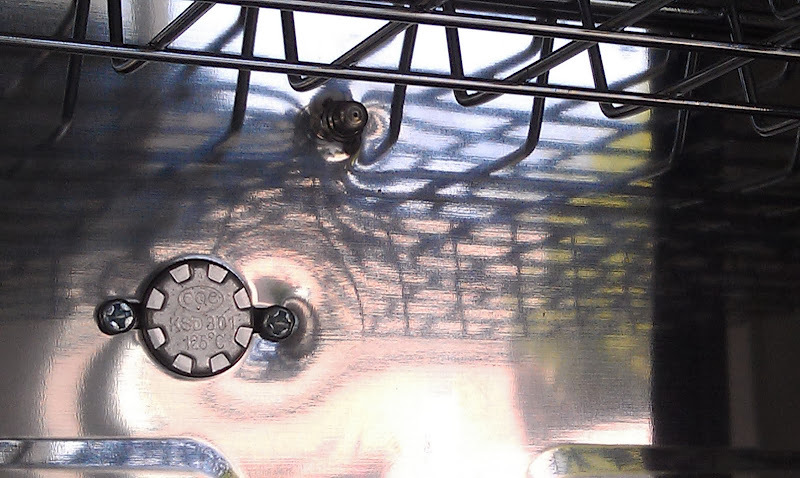 The only reason I turn the puck burner off when the smoking part is finished is to save on electricity. I know it is probably an insignificant amount but I have dual 500W elements and the additional 125W from the puck burner is not needed. If someone is running with the single 500W element then I'd say to leave it on all the time to aid in maintaining the chamber temp. I rescued the heatsink from an old PC that they were tossing out at work. I think it was off a video card. That heatsink on the Auber website looks like it could handle a LOT of heat. I attached it directly to the SSR with a mixture of JB Weld and thermal paste. Just a dab of the mixture at each corner and straight thermal paste elsewhere. I clamped everything together for a day or two. Two years later it still seems to be holding. 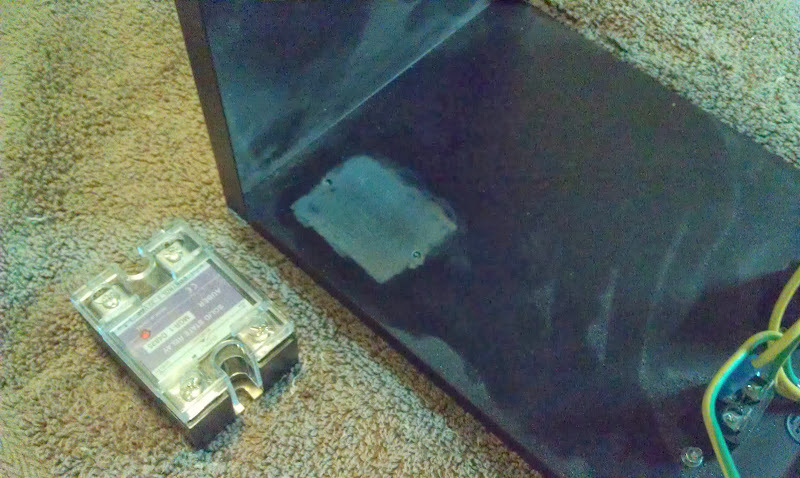 The SSR is bolted to the case and the cutout is just barely big enough to slip the heatsink through the hole. Finally had time to finish my PID installation. Fit it into the upper corner of the SG box like the others here on the older style. The SSR I've heat sinked to the case. Not gonna worry about a heat sink for now. All the docs I've found for a 25A SSR state heat sinking isn't needed until 8A. I'm not sure how effective the case is as a heat sink, but I figure 10A would be safe. Even with an upgraded element I'd only be around 8 - 9 amps max so I think I'll be ok. I wired the SSR output in parallel with the standard power wire to the smoke tower. This way I can turn the dial up to over-ride and go over my PID set temperature if I want. 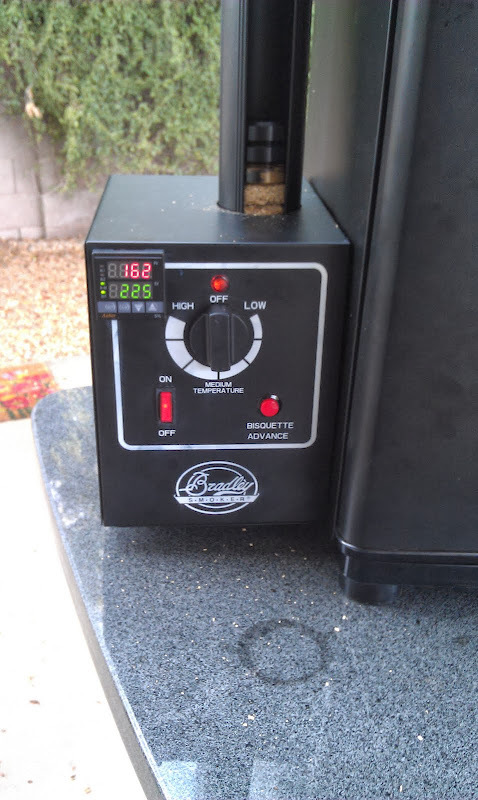 It worked good for pre-heating over set temp, then turned the dial off once I loaded the smoker. 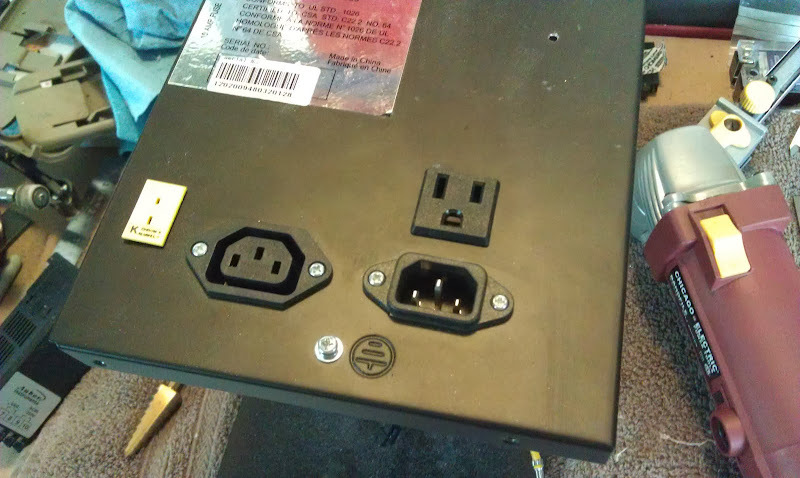 I also decided to add an additional outlet to the back too for a light if I want. Yesterday was my first smoke with it. Did a small cross-rib roast to try things out. I got a Maverick as well and took it out at 230. Seared on the grill for about 2 min per side. Final temp after resting was about 235. The results were spectacular, but I think I'd try for 225 - 227 to take it out next time. The flavor was amazing but I could of done more smoke. I only did 5 pucks on this one to start out (apple & oak). This morning, it's become obvious I need to do the heat element upgrade though. It is a bit chilly. 55 out. I loaded in 3 racks of baby back ribs. Set temp is 225. Was at 155ish after loading the ribs and hot water in the bowl. It' been 45 min now and it's only made it back up to 190. S-l-o-o-o-w-w-w-l-l-y-y-y-y-y creeping up in temp. Vent is wide open. That actually doesn't seem to be too bad of a recovery to me. To help my recovery time I pre-heat for an hour at a temp higher than I plan to cook at. I have a brick in the bottom of the box as a heat sink. And, I try to get the meat close to room temp before I start. Yes, it takes a while but my OBS eventually gets there. Even with temps in the teens. Be patient. Looks good. I've never seen the new style SG with a PID controller mounted in it. I wasn't sure if there was enough room but obviously there is. 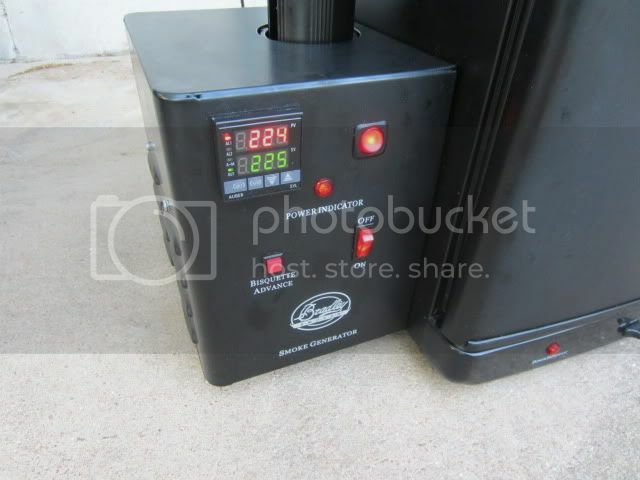 The dual element mod will make a significant difference in initial preheat and recovery times. With two 500W elements mine now takes around 8 minutes from the time I first power on the Bradley until it reaches 220*F.
Thanks for the input. I think I'll try the foil-wrapped brick or stones next time. I forgot to pre-heat to a higher temp but will plan on it in the future as well. The temp never did get over 208. After a couple hours, I ended up swapping to a 14ga extension cord (first was 16ga) and added a half dozen hot charcoal briquettes. That did the trick. I think I may have a problem with my puck advancer. When I had the SG plugged in on my desk playing with the PID, the puck advance went off after around 20 minutes. But, it never stopped. Just kept going and going. Played with the advance button a bit but ended up having to power off to get it to stop. 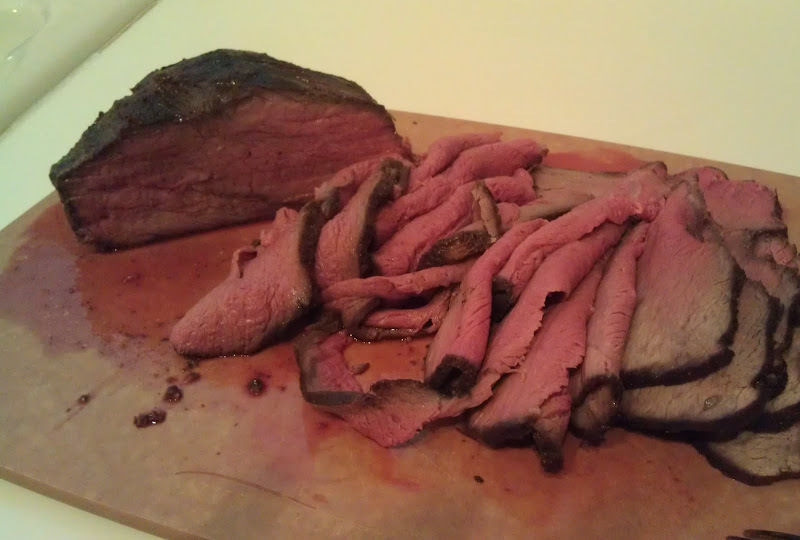 When I went out to season the smoker, the puck advance seemed to work fine. Through my 2 smokes it seemed ok except for on the last one, the last puck got pushed out without any burning. The advance was not going when I checked it, but my 3 puck savers were all pushed out and the last puck was un-burned. Any ideas? That extension cord might be part of your problem. I'm no electrician but I've read here not to use one unless absolutely necessary and then use a heavy duty one. I'm lucky. I have an outlet close enough that I don't need an extension cord. Something about being able to pull more amps through a larger gauge wire. And the shorter the distance, the better. 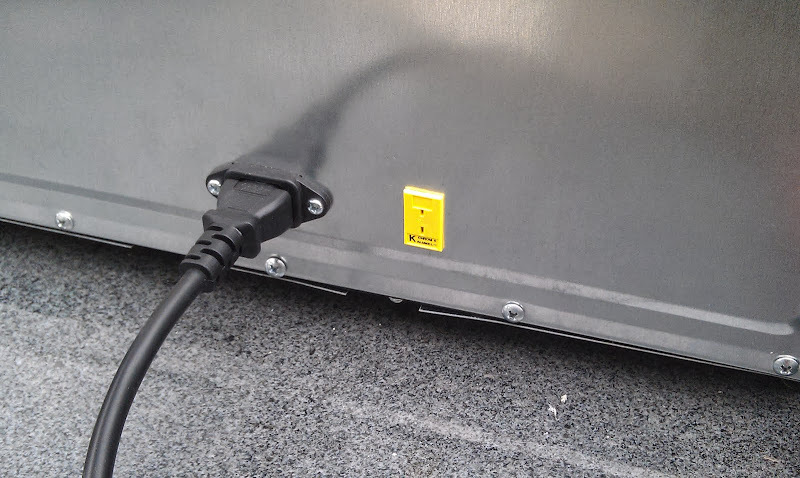 Also I read if you have other loads (appliances, etc) on the smoker circuit the available amps to the smoker could be reduced. All this translates to a lower temp in the smoker. Just my thoughts. Like I said, I'm no electrician. That extension cord might be part of your problem. Actually, I've read that here too. I'm gonna look for a shorter 12/14 ga cord. I need about 20' to reach and this is a 50' I have. Thanks. Took a look at that but it's a non-starter for the 611. Mine doesn't have a microswitch. 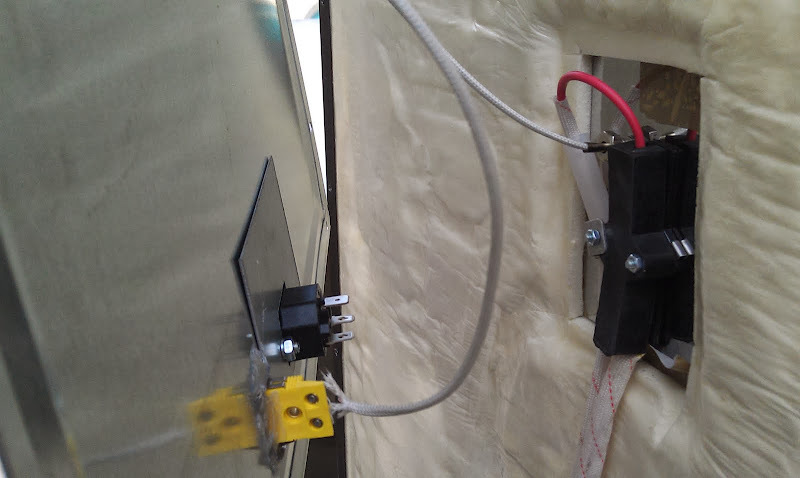 It uses some type of magnetic or hall-effect type sensor. It has a U - shaped sensor and the end of the feeder arm stops in the middle of it. For now, I'm gonna pull the cover back off and re-check all the connectors & see what happens. Do you have a wiring diagram of how you wired up your PID and SSR with the bs611? I haven't been able to find any instructions on adding a PID to the bs611 only on the original bradley smoker. I have purchased everything I need including a 900w element but I don't want to do the install until I am sure of the wiring for the BS611. I'd love to see a wiring diagram for the mod you made. I'm looking at getting a PID and while I'd enjoy the convenience of plug and play, I prefer the nice tidy mod with everything contained in the SG.